Surgery and Anesthesia - Earl Grey Veterinary Services P.C.Ltd. We perform a variety of both elective and non-elective surgeries. Elective surgeries such as spaying and neutering are important not only to control the pet overpopulation but also to make life better. 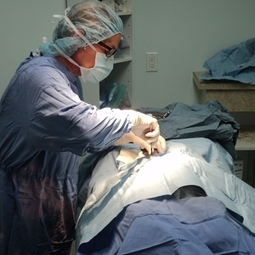 We also do a variety of complex non-elective soft tissue surgeries as needed for our patients. All surgeries are done under sterile conditions with Isofluorane gas anaesthesia. We make sure that pain is addressed before, during, and after each procedure. All our patients are monitored very carefully using monitoring equipment. While it is true that there is an inherent risk with any anesthesia or surgery, here at the clinic we take special care to minimize these risks. We do this by making sure that in addition to a thorough pre-anesthetic assessment of the patient we monitor the patient's vital signs very carefully throughout the surgery, which include respiration rate, heart rate, blood pressure and tissue oxygenation levels. We like to have all of our patients in intravenous fluids, which help to stabilize blood pressure, hydrate the patient and gives us venous access at a moment's notice. A registered animal health technician is assigned to each patient and monitore that patient very closely, taking care to watch both the patient and electronic monitors throughout the surgical procedure.